For vertical and horizontal installation wall slots. Vermibau is a pore-forming, dry ready mortar on a hydraulic setting basis. For slots up to 50 cm in width, no plaster bases are required. Great attention should be paid to the cavity-free application and sufficient coverage in the edges of slot areas to ensure sufficient sound insulation and achieve permanent heat insulation. Test certificate F180 is available for steel supports and beams. In order for the pore-forming ingredients of Vermibau to take full effect, attention must be paid that the whole contents of the container are thoroughly mixed within three minutes in free-fall mixer or by hand inside and intensively. In order to achieve a rigid plastic consistency of the ready mortar, at least 0.8 litres of water per kg of a dry mortar must be added. Depending on the size of the slot, the product should be inserted in several layers and in sections. The final layer can be evened out with a smoothing trowel. 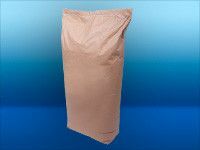 Vermibau ready mortar is available in 50 litre paper sacks.